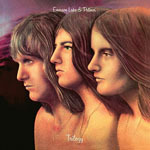 Share the post "Album review: EMERSON, LAKE & PALMER – Reissues (2)"
To many Emerson, Lake & Palmer represented the worst excesses of prog rock – a genre that was destined to have its collective arse kicked in the late-1970s. This latest tranche of remasters does demonstrate why prog rock got bad press at the extreme end of the spectrum, with a band like ELP who were rumoured to have a roadie whose job was to transport and clean the gigantic £2000 Persian rug on which they stood when performing. Plus their keyboard player (RIP) shoved knives into his organ and had a spinning piano. 1972′s Trilogy is enhanced here with a bonus ‘alternate album’ which adds an alternate version of ‘From The Beginning’ and a live version of ‘Hoedown’. This latter piece was to become a firm live favourite whilst the former demonstrated that the band was not all bombast and bluster and could fashion an attractive four minute pop song. Brain Salad Surgery is considered to be one of their most consistent albums and the only thing missing from this latest reissue is a facsimilie cut-out H.R. Giger sleeve. A bonus disc, mixed by Jakko M Jakszyk, brings the album into the modern idiom using alternate versions and different original mixes to fashion another ‘alternate album’. A similar process has been carried out on Uriah Heep’s ‘Very ‘eavy Very ‘umble’ which is part of a similar BMG reissue series. Whether it enhances or detracts is left for the listener to decide, for this reviewer it smacks a little of wringing the last drop out of the vintage wine bottle. There are though excellent alternate takes on ‘Karn Evil 9 3rd Impression’ including the original backing track although the session outtake ‘Tiger In A Spotlight’ (which appeared on Works Volume 2) is omitted. By the way, this is the album that contains the four-part ‘Karn Evil 9′ that is perhaps best known to a certain generation as including one of “Fluff” Freeman’s radio sweepers Welcome back my friends to show that never ends… This piece gave the title to the third release in this batch of reissues, the 1974 live album. These reissues are updated by Chris Welch’s liner notes, including new interview material, and are presented in attractive digi-packs. With Keith Emerson’s sad passing earlier this year, they provide excellent re-evaluation material or a starter for those who wish to steep themselves in a bit of unashamed prog excess. Don’t worry, we won’t tell. This entry was posted in ALBUM REVIEWS, ALBUM REVIEWS (Mobile), All Posts, Reissues and tagged album, Brain Salad Surgery, Carl Palmer, Emerson Lake & Palmer, Greg Lake, Keith Emerson, prog, Progressive Rock, reissue, review, Trilogy, Welcome back my friends to show that never ends…Ladies and Gentlemen. Bookmark the permalink.